In Australian Country 17.8 we profile homes in Victoria’s Macedon Ranges and South Australia’s Fleurieu Peninisula. 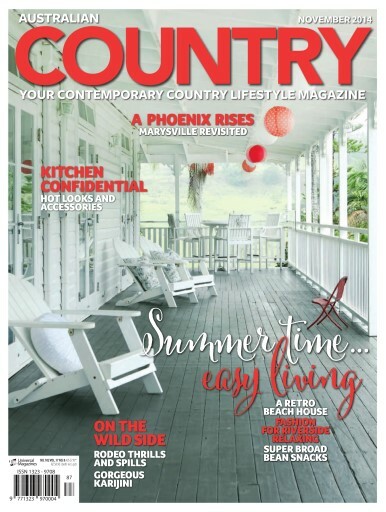 In NSW we visit a fabulously retro holiday house at Pearl Beach and a wonderful retreat in the Byron Bay hinterland. Our fashion feature heads down by the riverside and showcases clothes for enjoying the great outdoors. Our garden feature takes us to Maryton Park near Marysville, where much of hard work and determination has gone into repairing the devastation caused by the Black Saturday bushfires of 2009. 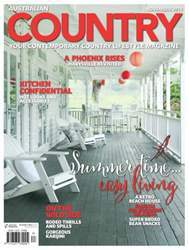 Our travel feature visits the truly gorgeous Karijini National Park in Western Australia’s Hamersley Range, stylist Sandra Hinton is planning a festive celebration, chief cook Kay Francis celebrates the fleeting delights of broad beans and our service feature covers the latest looks and accessories for kitchens.